The lying ziopress said that the train operator stated he screwed up and felt horrible. Reality? Immediately after the crash he was talking about how the brakes were disabled and the train’s motors were pegged to the max, and he could not stop the train from accelerating. The train driver, IMMEDIATELY after the crash, said the train was going too fast on a section of track with automatic speed control that set the speed automatically. When he realized the train was going too fast, (FAR above the normal regulated speed) he tried to apply the brake, and the brake was totally non functional. Since the trains are computer controlled just like all cars are now, a hack against the train is now obvious. The train was wasted “Hastings style”. Now that the truth of what the train operator really said is getting out, a few in the ziopress are trying to say Hezbollah did it. After getting wildly acclerated in the fully computer controlled section, the train then entered a section of track where there was no speed control at a much higher speed than it should be going 4 KM before the turn. Even in this section the operator could not apply the brakes, it was a dead stick. Because the speed was so high coming out of the previous (obviously hacked) speed controlled section, it traversed the following 4 KM in under a minute and slowed only to 200 KM during the 4 km stretch where there was no automatic speed control. 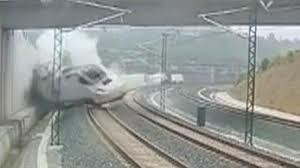 Immediately before the turn, he entered the ASFS system which was not hacked, and the train autobraked down to 190KM but it was too late and it crashed. The train operator had a dead stick the entire time. This was reported in the Associated Press. There were MAJOR Catholic activities going on at the time of this crash, and the train was packed full of top people from the Catholic Church. Since Israel and the greater Jewish community is at war with the Catholic Church, this trainload of top people was hijacked via hacks in the automated track systems and computerized controls on the train itself, in an attempt to murder everyone on the train as well as the operators. Since Jews think cheap as hell, they did not calculate that a train might actually stay on the tracks when going FAR OVER, 2.5X over rated speed around a turn, an over capacity they would never put into any system because they are bottom dollar with everything, so the train stayed on the tracks longer than they expected it to, and the engine succeeded in making the turn. This allowed the driver to survive and tell witnesses what really happened and it also allowed half of the people on the train to survive the crash. They wanted the crash to happen head on into a concrete retaining wall, and they did not get what they wanted. And if you are sitting there spitting, calling me an anti-semite, let me ask you this: If the train operator said the brakes did not work, that the train was going over speed in a section that is completely computer controlled, and that the entire hell ride was a dead stick, would that not be the top story? Obviously YES, and the fact that the ziopress is dead silent about this, even AFTER it was reported in the AP, it proves beyond a reasonable doubt THEY DID IT. And I laughed about the back stabs of this guy being a “speed demon” just because he talked about how fast the trains were and posted pictures of speedometer readings to his facebook page, when HE DID NOT HAVE CONTROL OF THE SPEED AT ALL, OTHER THAN TO BRAKE, and with the Jewish hack in place he did not even have brake control. The report about the train operator saying he screwed up is a LIE. He does feel terrible about it, but that is the same type of terrible a driver feels when a biciycle flies out of an alley onto a 50 mph street and gets hit. Not the driver’s fault, but terrible nonetheless, and possibly life changing. The Latino press is absolutely silent about the control system hacks, but they get fed by the Hollywood news in America anyway. All fake and special effects. And my final rip, which is an absolute DOOZIE will be attached to the end of this article tomorrow, because what is in it has to be documented for people to believe it, and I can’t do that now because Google is playing police man and I will therefore have to get the links on an unsecure machine, load them into this one, sign in, and post. Today I learned that Google is nothing but a weapon which forces privacy invasion, which functions perfectly even when people never try to or want to access Google.